EXTREMELY FINE GEM. 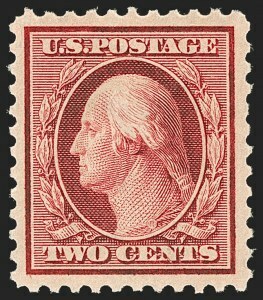 A SUPERB USED EXAMPLE OF THE 2-CENT PERF 11 DOUBLE-LINE WATERMARKED ISSUE, SCOTT 519, IN THE FINEST CONDITION ATTAINABLE. 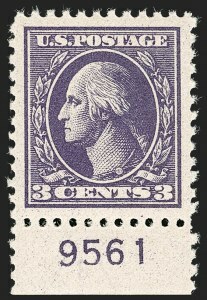 THIS WONDERFUL STAMP HAS BEEN GRADED XF-SUPERB 95 BY P.S.E., WHICH IS THE HIGHEST GRADE AWARDED. 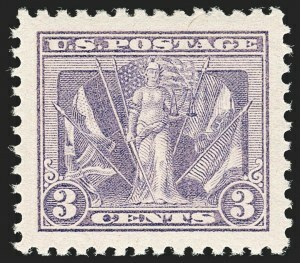 The Johl book quotes Joseph B. Leavy, the Government Philatelist, who described how this issue came about: "In September 1910 the Postmaster of St. Louis transferred to the Postmaster of New York City the following imperforate postage stamps in sheets of 400 -- 120 sheets of the 1c -- 1,500 sheets of the 2c. 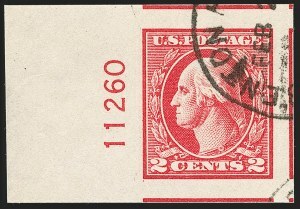 They had been specially made with uniform margins [sic imperforate] for use by the United States Automatic Vending Machine Company, which company had moved to New York at that time. 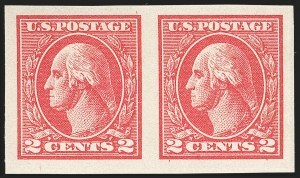 It seems that this firm had gone out of business for in 1917 the Postmaster in New York reported having on hand 1,467 sheets of the 2c imperforate, Series of 1908, and could find no record of the U.S. Automatic Vending Company, and asked that he be allowed to return them for credit. This being a period of conservation, the Bureau notified him to return them for perforation. They were perforated in September 1917, (four months after the last wheels of the perforating machines had been changed to gauge 11). In perforating them 34 sheets had been spoiled and were returned to the Bureau for redemption and destruction, leaving a total of 1,433 sheets of 400 or 573,200 stamps perforated 11, which were placed on sale in New York City." Johl further notes these were sold in the regular course of business and by the end of October had been distributed to post offices around New York. 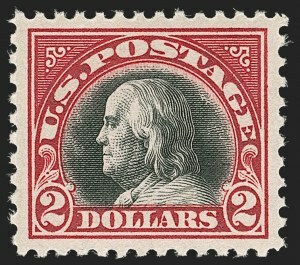 The majority was used for postage and destroyed before philatelists knew of the issue's existence. 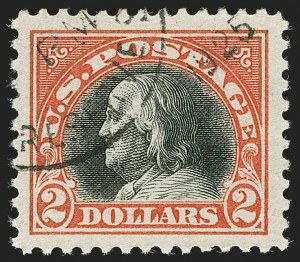 The example offered here, with a clear New York cancel and in superb condition, is a phenomenal rarity. Ex "Natalee Grace". With 1996 and 2009 P.S.E. 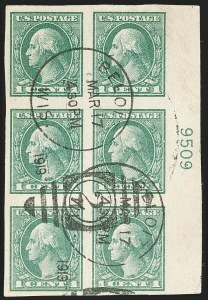 certificates (XF-Superb 95; SMQ $5,250.00). This is the highest grade awarded and it is shared by only one other. 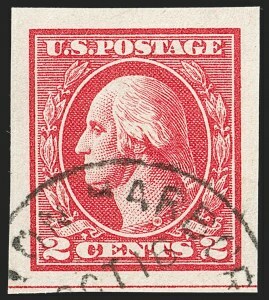 As another indication of rarity, only eight used copies have been graded in total, and the next-highest grade is a single example at VF 80. EXTREMELY FINE GEM. 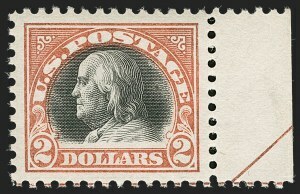 A STUNNING MINT NEVER-HINGED EXAMPLE OF THE $2.00 ORANGE RED & BLACK 1918 FRANKLIN ISSUE, WHICH HAS BEEN AWARDED THE GRADE OF SUPERB 98 JUMBO BY P.S.E. Ex Whitman. With 1997 P.F. and 2008 P.S.E. certificates (Superb 98 Jumbo; SMQ $9,000.00). This is the only example in the P.S.E. Population Report graded 98J. 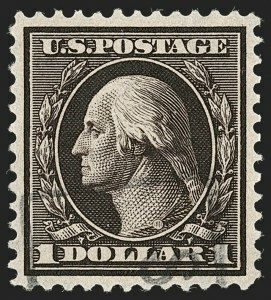 Only two stamps grade higher (one each at 100 and 100J). EXTREMELY FINE GEM. 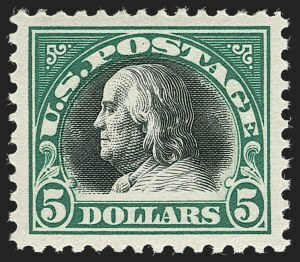 THIS STUNNING MINT NEVER-HINGED EXAMPLE OF THE 1918 $5.00 FRANKLIN ISSUE HAS BEEN AWARDED THE PERFECT GRADE OF GEM 100 BY P.S.E. -- THE HIGHEST GRADE AWARDED. Ex Merlin. With 2007 P.S.E. certificate (Gem 100; SMQ $6,5000.00). 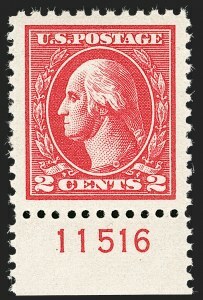 Only one other stamp has equaled this perfect Gem 100 grade. 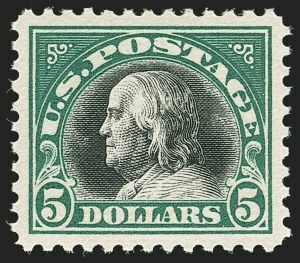 EXTREMELY FINE GEM MINT NEVER-HINGED EXAMPLE OF THE 1918 $5.00 BI-COLOR ISSUE, GRADED SUPERB 98 BY P.S.E. With 2013 P.S.E. 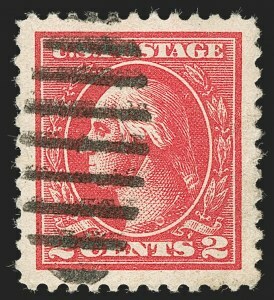 certificate (Superb 98; SMQ $2,650.00). Only three grade higher (highest is the 100 offered in the previous lot). EXTREMELY FINE GEM. 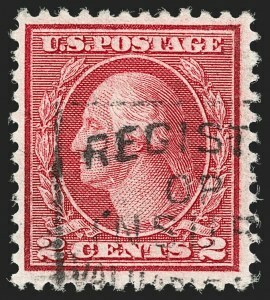 A SUPERB MINT NEVER-HINGED PLATE NUMBER EXAMPLE OF THE RARE 2-CENT TYPE VII IMPERFORATE, GRADED SUPERB 98 BY P.S.E. 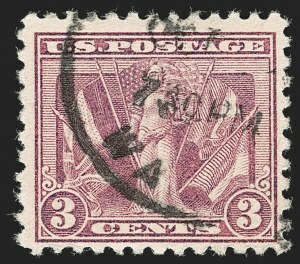 Most Type VII stamps were used by private vending and affixing-machine companies. 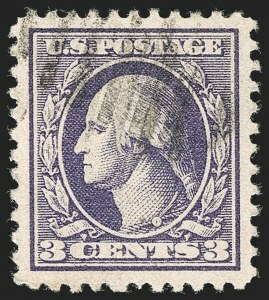 However, unlike Scott 314A and 482A, a small supply of the imperforate 2c Type VII stamps did reach the public. With 1976 P.F. and 2002 P.S.E. certificates (Superb 98; SMQ $5,750.00). Only one grades higher (at 100) and only two others share this desirable grade. 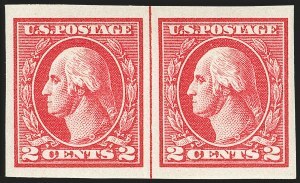 EXTREMELY FINE AND RARE MINT NEVER-HINGED PAIR OF THE 2-CENT TYPE VII IMPERFORATE. EXTREMELY FINE GEM. 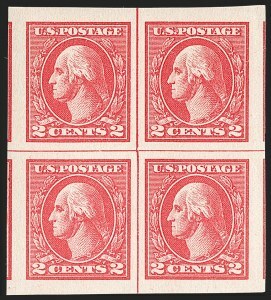 A SUPERB AND RARE USED SHEET-MARGIN COPY OF THE 2-CENT TYPE VII IMPERFORATE. EXTREMELY FINE GEM. 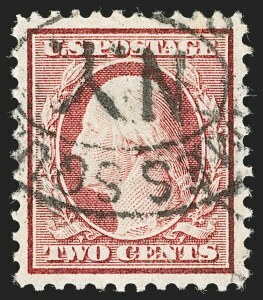 A SUPERB MINT NEVER-HINGED EXAMPLE OF THE $2.00 CARMINE & BLACK, GRADED SUPERB 98 BY P.S.E.